Homewood Suites by Hilton Anaheim Main Gate welcomes Kanye West and the Saint Pablo Tour to the Honda Center on Wednesday, November 23rd, 2016. The Saint Pablo Tour wraps up a highlighted year for Kanye West with another #1 hit to add to his ever-growing list. The Life of Pablo has already been buzzed about being one of the albums of the year. Fans are encouraged to stay the night at the Homewood Suites by Hilton Anaheim Main Gate, just ten minutes from the Honda Center, after watching their favorite star. For more information, please visit http://www.hondacenter.com/EventDetails.aspx?EventID=1209. Homewood Suites by Hilton Anaheim Main Gate is perfect for business travelers, leisure travelers, families, extended-stay vacationers and everyone in between. Within easy walking distance to various dining and entertainment options, Homewood Suites is just one short mile to Disneyland® and ten minutes to the Honda Center, ideal for guests looking to explore all of Anaheim’s entertainment, dining and shopping options while staying in sunny southern California this fall. With amazing amenities, comfortable suites and much more, Homewood Suites works hard to ensure guest satisfaction in all areas. Guest amenities include: full kitchen in all suites, complimentary hot, full breakfast daily, an evening social Monday through Thursday nights, business center, free Wi-Fi, Disney® Shuttle service for a small fee and more. A guest favorite, the Welcome Home® reception, available Monday through Thursday nights, is complimentary and offers a variety of light appetizers and drinks, subject to legal drinking age. Guests may relax in this all-suite hotel, with king or dual queen suites, as well as accessible rooms available upon request. 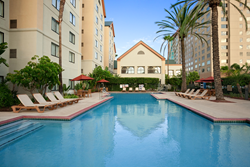 For more information or to make reservations, guests may call (714) 740-1800 or visit http://www.homewoodsuitesanaheim.com. Homewood Suites by Hilton Anaheim Main Gate is proudly managed by Stonebridge Companies in Denver, Colo.